An important part of any child's development is the idea of play. There have been numerous scientific studies that suggest continued play has a crucial role in the development of language skills as well as academic achievement. While we won't get too deep into the research data here, if you want to learn more of the science of children and play, check out this article by Dr. Gwen Dewar on Parenting Science. Games can promote learning and mental growth in kids of all ages. So here's a fatherhood roadmap to help identify the different kinds of games kids should try as they grow. Obviously, babies aren't up for much in terms of critical thinking – but you can still use play to help improve their development. Games like peek-a-boo – even if they seem like mere silliness – help children develop the concept of hiding, set the foundation for other mental tasks, develop the concept of object permanence, and even help their vision. A baby's sense of touch is easy to stimulate. You can also give them swatches of different fabrics and materials to let them play with varied textures. Picking up the fabric and waving it around can even help build their arm strength. Once a child has started to talk, then the role playing can begin. Whether my daughter wants to be a princess, a cowgirl, or an alien from outer space, that father and daughter playtime will help stimulate conversation as well as social skills. Number line games – such as Life – also stimulate basic Math. As children get older, you also need to be careful about how you introduce learning games. Just like eating their vegetables, kids may not want to do something if it's "good for them." So don't harp on it and keep it natural. Further on, the games parents can introduce also get more complex. Card games like Uno develop attention and the cognitive relationship between objects and numbers (which, believe it or not, is the building block of algebra). Games like Monopoly also teach strategy, as well as money skills. Even the junior version, which uses amusement park rides instead of properties, is a good stepping stone. Once kids start to approach middle school, pretty much anything is fair game (pardon the pun). Scrabble – or any of its 8 million smartphone-based cousins – develops vocabulary and math skills at the same time. A game like Clue, meanwhile, can push kids to use their deductive reasoning, while Risk creates a dual-focus of geography and probability. 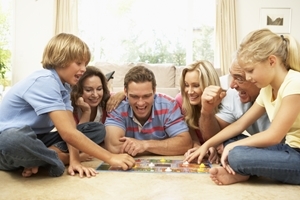 Above all – no matter what age – tailor games and activities to your child's interests. That way, the games – and the learning that comes with them – stays fun.